So, as we scoured the internet and asked friends and family about each honeymoon locale we were thinking of, we finally made a decision, by process of elimination....and the winner is: SICILY. Woo-hoo! We are very excited to start the actual planning and booking of our very own Sicilian honeymoon....there will for sure be yummy food, delicious wine, amazing sites and much relaxation time! 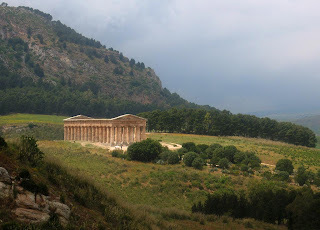 Please pass along any tips on Sicily, we are especially looking for great restaurants! By the way, Thank you all for voting on the site and giving us your opinions and well wishes for an awesome honeymoon! We loved talking to you about it and hearing your thoughts! Grazie a mile! Clearly there has been a conspiracy to defraud Bora Bora from its rightful place atop the voting. If I find out Gabe gave a crappy presentation in defense of Bora Bora, so help me... I'll just have to take my wife there and prove him wrong! That'll show ya! Also a bit disappointed in the Bora Bora thing since that is a very cool place just to say - 'BoraBora' - it has a bit of a ring to it, doncha think? No matter where you guys go, you'll always find an adventure!! Awesome for you! !